This ancient evil face belly button ring will surely turn heads and add flair to any outfit. It has a stainless steel shaft and evil face with its tongue sticking out as a bottom ball. 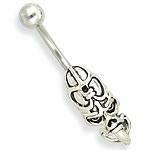 If you feel like sticking your tongue out, this belly ring is perfect for those who want to be polite and stick it out in disguise.